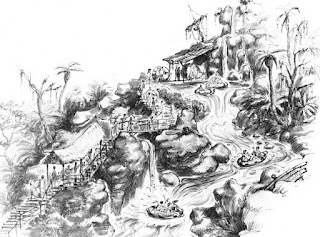 River Country may have been the first water park in Walt Disney World’s repertoire, but Typhoon Lagoon added a whole lot of land and a new level of thrills to the water playground experience. With the park slated to open in early 1989, the Disneyland Line was one of the first publications to get the scoop as to what was coming downstream to the Disney portfolio when it ran Typhoon Lagoon to Open at Walt Disney World in February of that year. 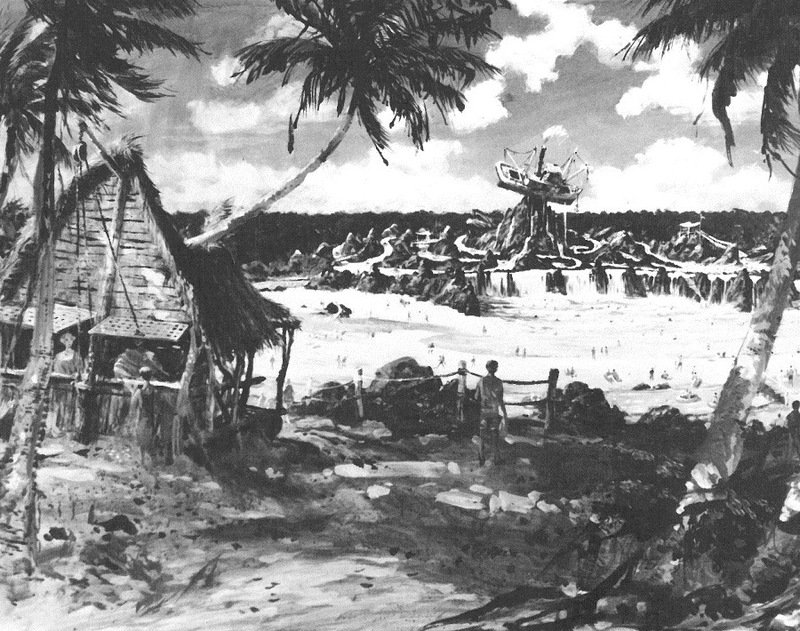 While the article didn’t feature any construction photos, it did include some fantastic concept artwork for Typhoon Lagoon. Below we present the article in its entirety, without any interruptions from your beloved narrator. “In just a few months, Walt Disney World guests will snorkel among thousands of tropical fish, plummet down the flumes of a volcanic mountain, and ride waves in the world’s largest inland surfing lagoon. “The place: Typhoon Lagoon, a massive, one-of-a-kind water theme park, which joins Disney-MGM Studios as a major new attraction for 1989. The swimmer’s paradise is four times the size of River Country, which opening at Walt Disney World in 1976. “Sunny beaches and lazy streams are among the unique facilities surrounding the water par’s 95-foot mountain. 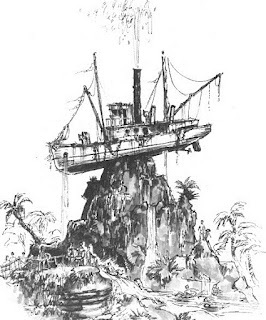 The new water-entertainment area takes its theme from a legend of romance and danger evident by a wrecked fishing boat stranded on a mountain peak, and storm-tossed automobiles resting in the branches of giant trees. "Located halfway between Walt Disney World Village and the new Disney-MGM Studios, the project includes nine water slides and roaring streams up to 400 feet long coming down the mountainside, and a two-and-one-half-acre wave-making lagoon. There will be a unique salt-water snorkeling pool where guests will come face-to-face with colorful fishy creatures of the Caribbean. “Typhoon Lagoon uses state-of-the-art technology to create six-foot waves, streams that look just like those in Hawaii and Fiji, and a chance to have a close-up look at the tropical marine inhabitants. Demand for the snorkeling experience has grown ever since the opening of Epcot Center’s Living Seas, where swimming is limited to staff divers. “The lagoon includes separate activity pools for young children and families, and features geysers, fountains, bubble jets and slides. In the family pool, an overhead cable drop will transport adventurers Tarzan-style across a course of random water obstacles to a water fall inside a scenic grotto. “Another unusually themed experience circling the Lagoon is a meandering, 2,100-foot river. Guests hop onto rafts and inner tubes for a relaxing tour that takes them through a rain forest and a hidden grotto with a spectacular view.